Mathematics is the language of the universe. It is beautiful, logical, abstract, relevant, and practical. Furthermore, a background in mathematics can lead you just about anywhere. Math majors have chosen careers from law, medicine, computer science, and engineering to philosophy and the visual and performing arts. Increasingly, professions require knowledge of higher mathematics. The Williston Mathematics Department strives to expose all students to the beauty of work by the great mathematicians— Noether, Erdos, Newton, Escher, Turing, and Lovelace—while also realizing that many, if not all, students will need mathematics for its practical applications. Through their studies of mathematics and with the support of a dedicated faculty, Williston students at all levels build habits of mind that prepare them for what lies ahead. 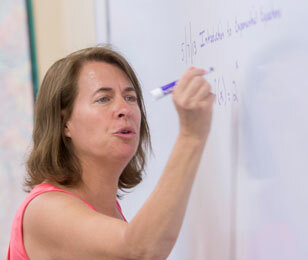 The primary goal of Williston’s math department is to help prepare students for college mathematics. The course sequence— Algebra I, Geometry, Algebra II—teaches the foundation of mathematics that all students need. Once they have mastered the foundation, students can delve more deeply into mathematics through a variety of upper-level courses. While the content of these courses varies, the goal of each course is the same: to help students become creative problem-solvers. Whether students dislike math or enjoy puzzle-thinking, they will find teachers dedicated to supporting them. Each course offers the opportunity to review basic skills and to master the core knowledge of the subject. Students are challenged to move beyond memorized rules to discover the source of rules, to examine why they work, and to theorize about how they are used to solve problems.